Today we went out to Boca Springs, it was hot and dry out there. A few wildflowers are starting to peak out but I think the season this year will be short unless we get some more rain. Boca Reservoir is still very low, with the gravel banks on the side still standing 20-30ft out of the water and the Little Truckee River is flowing is well below the campground (where it normally enters the lake). This area has a lot of crisscrossing fire roads and OHV trails so pay attention to the direction you're taking and look for landmarks. There are incredible views on this hike and you can even see Squaw Valley and the Siberia lift at the top of the mountain next to the Palisades. This is a loop hike or can obviously be an out and back if you like. From the campground head up past the spring of Boca Springs, you'll be heading up hill and the road is easy to find at the back of the campground. Once you reach the top of the first hill keep to the road on the left and it will wind its way up a hill. At the top of next hill take the road to the left and you will shortly come to a three way intersection, from here take the road to the right which heads further up the hill. Follow this road for roughly a mile and the road will take a sharp to turn to the left, here I tend to go right and there is an old logging road that parallels the road you just came up. Following this road will lead you back to the three way intersection, at the intersection this time take the road to the right which will head back down the hill for about a mile and will come out below the meadow at the Boca Springs campground. From Truckee take I-80 east towards Reno and get off at the Hirschdale exit and take a left under the freeway (there is also an on-ramp here for easy exit on your return trip). Follow the road over the Truckee River and across the train tracks and you'll quickly come to Boca Reservoir on the left. About 2 miles along the road there will be a paved road heading off to the right with a sign that says: Boca Springs 1 mile and Verdi Peak 14 miles. Take this road, it will quickly become dirt. You can either park here and hike up the road to the campground or drive up to the campground (the dirt road is not too bad and easily do-able in a car) just stay to the left and you'll reach the campground. Getting water at the spring of Boca Springs, the actual spring is fenced off but they've nicely added this pipe which delivers very fresh clean water from Mother Nature! There are lots of fire trails and OHV trails in this area. The area is heavily treed but has been logged in the past. The trees are mostly Jeffery Pine and cedars (and there are some monsters up here). You will occasionally see people on quads and there are people that use some of the meadows for shooting guns but they are few and far between so you'll rarely see anyone out here. Water: None, very dry right now. There is water at the spring and in the small stream where the spring water runs off. 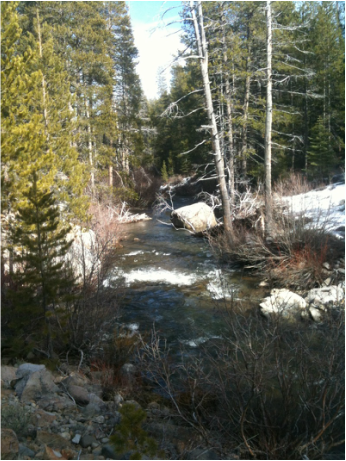 Today my Dad took me to one of my favorite places, the Little Truckee River. I love the river so much, I just run up and down the shore and take the occasional dip in the nice cool water. There were some fishermen out today, one was sitting on a log next to the water eating a sandwich, I sat patiently next to him for at least a minute giving him the gaze but alas he would not give me any sandwich - mean! 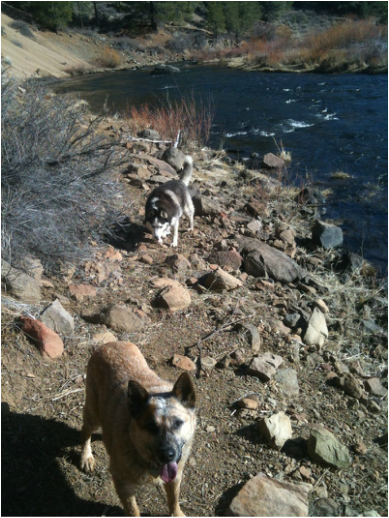 This is a great hike for dogs and people who want a casual stroll along the side of a beautiful river. There were even some yellow wildflowers out but my Daddy wasn't too happy as it's too early but what can you do. This is an out and back hike, from the parking area you can hike down the river about 2 miles before having to turn back as there is a steep landslide on the north side of the river that prevents travel (in the summer you can wade across to the south side of the river and continue on but it's too cold now). There is a well defined trail paralleling the river for about 1.5 miles heading down river, after that it's rock hopping and picking your way through the gravel to continue. Today we went about 4 miles as an out and back. As mentioned above this is about the limit unless you can find a way to cross the river. From Truckee take I-80 east towards Reno and get off at the Hirschdale exit and take a left under the freeway (there is also an on-ramp here for easy exit on your return trip). Follow the road over the Truckee River and across the train tracks and you'll quickly come to Boca Reservoir on the left. Continue following the road for about 4 miles until you see dam at Stampede Reservoir. There is a well defined parking area on the left, once you've parked the trail heads downstream directly from the parking lot. Cold water coming off the bottom of Stampede Reservoir fill this medium to small river. The south side of the river is well treed and the north side is mostly gravel and small boulders. You will almost always see a fisherman or two perfecting their craft and usually there are people hiking with their dogs (especially on hot days). Easy stroll today down to Prosser Lake. This is a nice area to come during "mud season" as the Forest Services closes the road to Prosser Lake. You can park in area by the gate and walk for several miles one way down the road and not have to worry about getting muddy (so thankfully we don't have to get toweled off!). This hike is popular with locals walking their dogs. You can hike the road 1.5 miles down to the campground or take one of the many trails that diverge from the road. Most trails lead down to Prosser Lake and campground area. To get there see the directions for the hike here. Parking area is right across Highway 89. Today we went to the Beaver Pond Trail, I'm sure it has a name but my Dad doesn't know it's real name so they've name it this... Unfortunately for me I didn't see any beavers but they would have been fun to chase, I smelled them while my Dad was taking the photo of the pond below. To the left they have built up a wall of sticks 6 feet high that is holding back all of the water. This is an easy hike and is an out and back, today we went about 4 miles. A few weeks ago we took the trail all the way out to Stampede Reservoir which is about 7 miles round trip but the field leading down to the reservoir was too muddy today with the warm temperatures and snow melt. This hike leaves from Highway 89 and parallels the road for a quarter mile and then heads into a canyon filled with Lodgepole and Ponderosa pine along with Fir and Aspen trees. It parallels a healthy stream the entire distance out to Stampede Reservoir. 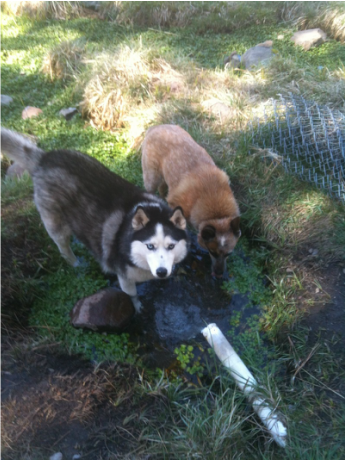 Here's a pic of us getting a drink. From Truckee take Highway 89 towards Sierraville. About 2 miles past the Hobart Mills turnoff you'll come to a bridge in the highway and there is a parking area on the right that fits about 10 cars. Well treed area with lots of large Ponderosa pine. As mentioned earlier there is also a lot of Lodgepole pine, Aspens and Fir trees. Once the trail starts to head down the canyon the noise of the human world slips away and it is very peaceful and quiet. This trail is quite popular with hikers and most have dogs tagging along. Would be a great walk in the summer to get a swim in at Stampede. 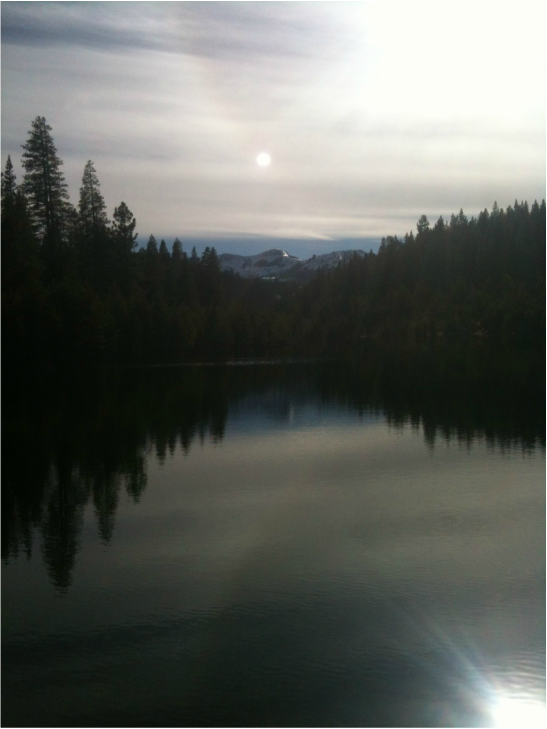 Today we went to the Donner Summit Canyon which is below Sugar Bowl at the west end of Donner Lake. We were so excited to get into some snow that we were doing hot laps back and forth and rolling around in the joy of it all. Spirit got a little crazy and jumped on the ice in the beaver pond and when his iceberg broke off he had to swim for it. 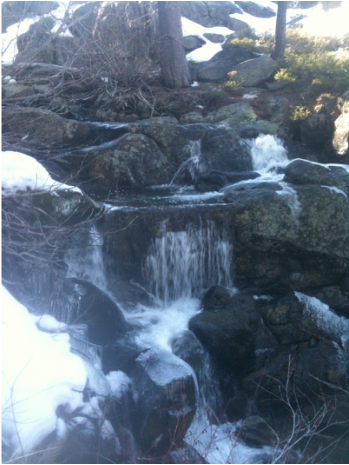 This is a nice hike to a lookout over Donner Lake and there is a nice stream that runs to right side of the trail. At the lookout there's a picnic table to enjoy the view, hopefully we'll picnic soon as I love sandwiches :) This trail is maintained by the Tahoe Truckee Land Trust and is well maintained and has signs with directions. From the parking area head to the west through the locked gate, this trail is for hiking only and there aren't usually many people out there. You'll quickly cross a stream on an old railroad car, following the trail straight you'll come to a beaver pond and you can admire the hard work they put in to build their houses. From here the trail goes about a quarter on the flat ground and then heads up the hill with the stream on the right. Another half mile up the road a stream has eroded the road pretty severely, from here you want to be on left side of the road and you'll see a sign for the lookout and picnic area, follow the trail parallel to the stream and you'll reach the lookout in a quarter mile along the road. You can also go right here up the road and it heads up to a small waterfall which is beautiful in spring and early summer. The trail continues on the Donner Summit if you so desire however there are some pretty large cliffs paralleling the trail so leashes are advised in this section of the road. The trail winds through some beautiful forest with some very large trees. My Dad wore his boot crampons today as the trail was pretty icing in sections, hiking to two legs must be hard. Easy but it is a climb of about 300 ft to get to the picnic area and probably 500 ft to get to the waterfall. 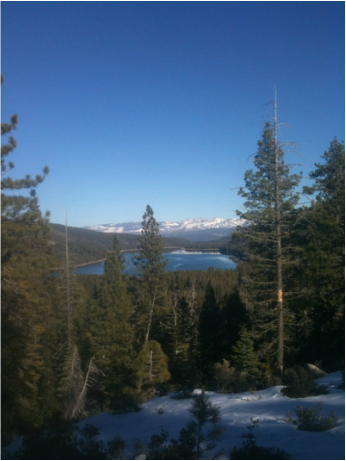 3 miles round trip as an out and back to the Donner Lake lookout, another half mile round trip to the waterfall. From Truckee head west on Donner Pass Road (Old Highway 40) past Donner Lake. About a quarter mile past Donner Lake you will see a parking area on the left, there are signs here describing the trail and room for 8-10 cars. 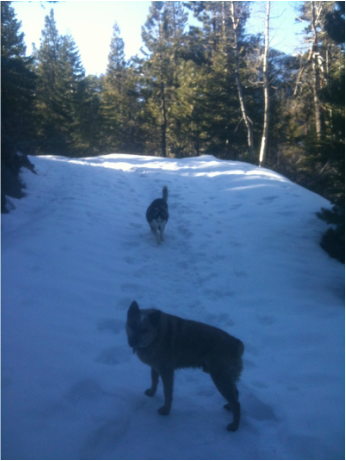 Leash required: Not on the trail but advised near the road as Donner Pass Road is pretty busy at times. Water: Plentiful in spring and early summer, stream runs pretty slowing in late summer and fall. There is always water in the beaver pond. Usage: This is a hiking trail mostly, occasional mountain bikers but as the trail doesn't really loop they seem to avoid it. There are no motorized vehicles allowed on this trail. Emerging from river after a break, it's HOT today! 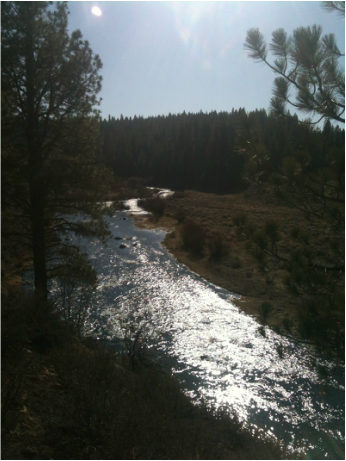 Back to Truckee River again today (see the post from Feb 19th, 2014 for trail details here). We got about 4 miles in as my parents didn't have a lot of time due to work and doctor's appointments (my Dad hurt is shoulder but he'll be OK). It was warm again today, 52 degrees at 4:30 pm when we got back to the car to head home. It was nice to play in the water and cool down, I'm still running my winter coat but the way things are going I might need to start shedding. It's supposed to start snowing on Wednesday next week, paws crossed as I'd like to go snowshoeing and play in the snow. See you tomorrow! View of Prosser Lake and Verdi Peak from the top of the Prosser Loop Trail. Today we went out to the Prosser Hill Loop Trail. 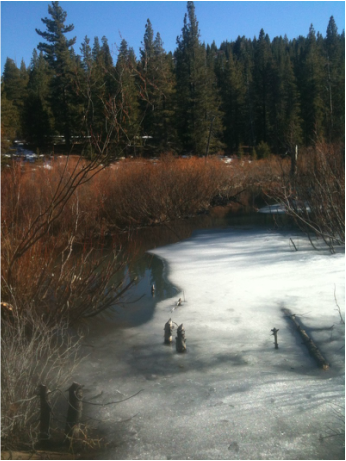 Weather was warm for Truckee in February running around 52 degrees. 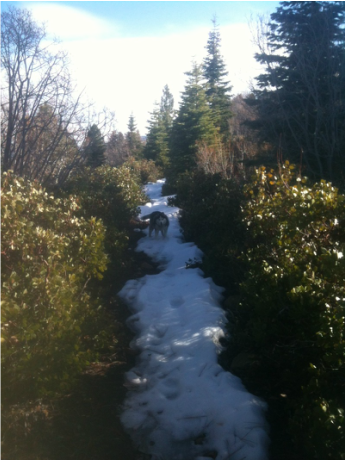 The trail was muddy in many sections combined with patchy snow (see picture below for current conditions from Feb 20, 2014). The Forest Service has done a good job thinning out the trees in this area however off trail there is quite a bit of forest litter which makes hiking off the trail difficult. This trail climbs roughly a thousand feet from the parking area to ~6600 ft. 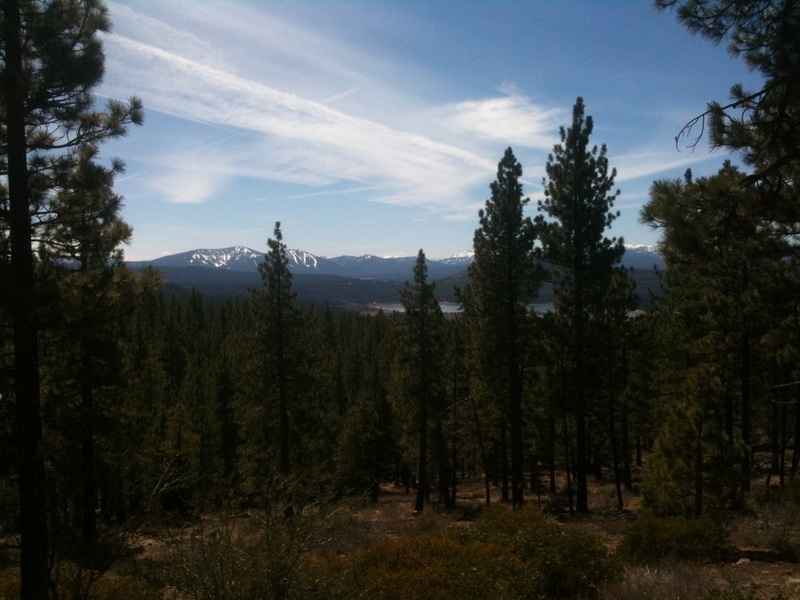 It has a brilliant view of Prosser Lake, Verdi Peak, Martis Valley and Northstar. If you want to get away from people this is the place to go, I rarely see anyone out here. Moderate to difficult. There are sections of steep climbs which are mediated by sweeping switchbacks heading down. Roughly 6 miles, there is a map at the parking area near the bathroom. Take Highway 89 heading to Sierraville from Truckee. 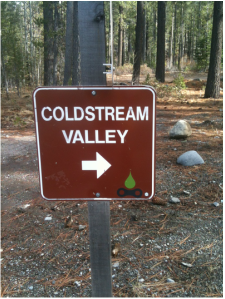 About 5 miles past Truckee there will be a sign for Prosser Hill OHV area and the parking is on the left. There is a vault toilet and a map detailing the area. From the parking area head slightly left and you will see a sign for the trail. You will head up a switchback trail to the top of a small peak with a great view, after this the trail straightens out for 1.5 miles and then begins to climb again after a quick view of the Donner Summit area. From here the trail will head to the top of Prosser Hill with sweeping views, the decent is on a switchback trail that is well maintained. Once down at the bottom follow the dirt road back to the parking area, there is a sign there to provide direction but just stick close to the base of the hill. Usage: Technically this is an OHV and mountain bike trail but there is rarely anyone out there. In winter there are snowmobilers but they tend to unload at the Prosser parking area and head up the road heading right. Being a Canuck it was great to see the Canadian women's hockey team persevere and win the gold today. Great finish to a great game with an amazing comeback in the last 4 minutes. USA was a half inch away from closing out the game on the empty net goal so maybe it was meant to be for Team Canada! 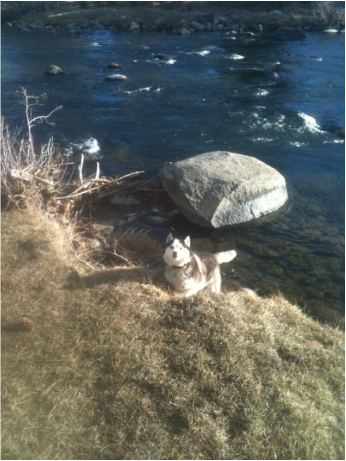 Today we went to the Truckee River and hiked about 3 miles along the river. 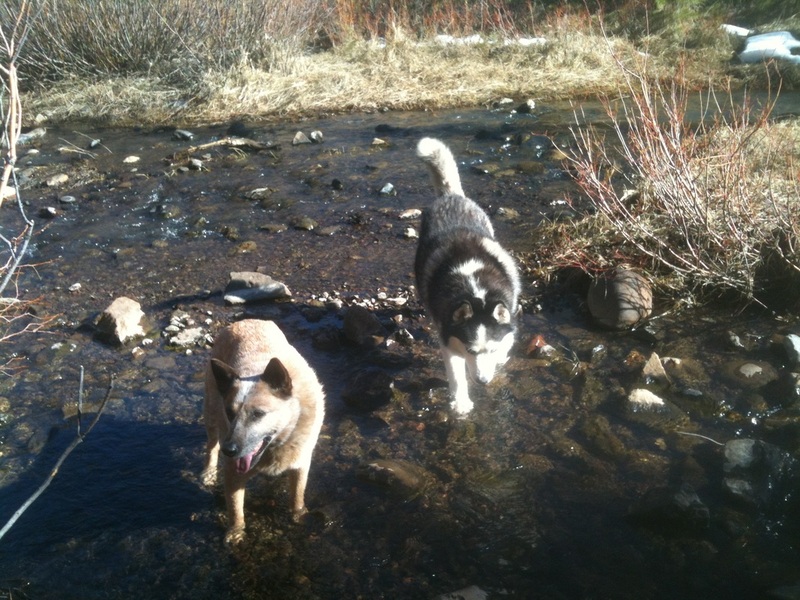 The weather was warm (51 degrees) so it was nice for us to play in the water (yes, I'm a swimming Husky). The trail wasn't too muddy even though it snowed a little bit yesterday night but we still needed to be toweled off, which we hate but nothing in life is free. As far or as short as you like as an out and back. Maximum is probably 6 miles as you'll reach the Glenshire bridge to the east and Truckee to the west. From old town Truckee head east along Donner Pass Road and take the first right once leaving town on Gleshire Road (past the lumber yard road). Drive down Glenshire about 2 miles and take a right just past the little house on left (there are lots of parking areas along the road so choosing any will do). Once out of the car you will need to cross the train tracks so leashes are suggested, these are active tracks so be careful. Once across the train tracks make your way through the sage brush and down to the river. There is a trail that follows the river going in both directions. Enjoy!